If you are looking for a secluded, romantic, luxury condo situated at the best part of the beach with nothing but pure white sand aqua blue ocean look no further. The views from this condo are stunning. Second bedrm. has a flat screen TV/DVD king or two twin size beds w/ adjacent bath and views of the ocean. Amenities: Kitchen is newly renovated very large and fully equipped with microwave, dishwasher, counter bar with unobscured view of Sound and Gulf both there is a kitchen desk area great for using the free wi-fi. There is a new refridgerator w/ in door ice and water dispencer. Living room and dining room are together with sitting area for six at table both enjoying a stunning view of ocean by day and the lights of Pensacola by night. The L.R. has a large new flat screen T.V.with dvd/vcr player along with a sterio. There is a balcony and bay window area off the living room with a view of the navil lighthouse and miles of snow white sand. Master bedroom has attached bath with Jacuzzi tub and sliding door to balcony and TV. Queen Size bed. Second bedroom has double bed and bath is adjacent to bedroom. Couch in living room makes into queen size bed. Linens are included. Washer and dryer in unit. Iron and board. Central air conditioner. Pool is in complex and condo has a view from balcony of pool and private beach. Beach items include umbrella, chairs, and spread. Activities: Beaches on either side with the absolute whitest and most beautiful beaches I have ever seen. Sand dunes over 30 feet tall with sea oats that are reminiscence of Old Florida. This island is not crowded and has miles and miles of ajacent parks that are undisturbed. Ft Pickens is next to the condo (at end of island) with at least 6 miles of beaches and beautiful trees, Ft Pickens is a wonderful example of a pre Civil War Fort ,with natural wildlife and a museum. At Ft Pickens there is adventure galor with the Ft/ being built with six million bricks and dating back to pre civil war time. The Ft. offers free guided walking tours daily. There is also a free fishing pier. At the other end of the island is Navarre Beach and there are at least 7 miles of park before reaching there. All these parks are undeveloped, except bike paths, picnic and bathroom facilities. The bikes are the old time kind and you can pack a lunch, put in basket, ride towards Navarre and stop and have a picnic on the beach. Our end of the island is very narrow and most of the island has only one road with little traffic. In the town there are marinas with sailboats, waverunners, pontoons, parasailing, windsurfing, and deep sea fishing, 1/4 mile long pier (longest on Gulf) for fishing and the most beautiful sunsets. There are places for rentals of bikes, motor scooters, roller blades, and rods and reels for fishing (no permit required). A nice boardwalk in the center of town has live bands and great seafood and Mexican restaurants, along with bars and a very active nightlife, and volleyball in the daytime. Some of the best oyster for pennies each (special sometimes for .25 each) that are big and juicy. In the summer there is a free trolley for those who don't want to drive and the Condo is within walking distance (1/2 mile) of one of the best restaurants and bar on the island. All this is not very pricey (considering the quality) and you can enjoy much of the island just for free. I'm semi-retired CPA and I enjoy traveling, especially to beach destinations. This is such a great location and now that they added the snorkel reef that will satisfy another passion. Growing up and living in Ohio only offers limited beach time my husband and I purchased this condo and have many wonderful memories of spending time and relaxing there. Then our grandchildren came along and we knew we would want to see them enjoying the condo and beach we love so much also. We decided to share our place with others so they cam make memories like ours. Both my husband and myself have always shared a love of the ocean.We both had traveled to Florida frequently as children and knew the charm of old Florida, not the modern Florida of high rise condos and strip malls. So when we saw Pensacola Beach with its ''old Florida charm'' we knew that this was the spot for us. Pristine beaches with absolutely beautiful white sand, dunes two stories high, well you get the picture. We know that our guest will love the area as we do. Watching the unbelievable sunsets from the verandas, watching as a dolphin swims by. At night the light tower from the navel base across the bay is so romantic. It's great to watch the Blue Angels practice from our balcony if they are in town. We enjoy the lights and boats that go by on the sound. White sand very comfortable to walk on. Water is aqua colored and clear enough for you to enjoy the bountiful sea life. Views from front and back, stunning sunsets from verandas! Romantic night views of the navel light house and the lights of Pensacola twinkling in the distance. The ocean and sound are immediately outside our first floor condo, could not be closer. The unit is on the first floor with parking under . There is one flight on stairs from parking to unit, or if you would rather use elevator it is there also. The unit has a completely furnished 200 square foot kitchen with a great view of the ocean. The wrought iron and beveled glass table offers a wonderful view of the ocean to enjoy whil dining. The condo we stayed in was pretty basic but clean. The bed in the bedroom next to the back patio had a mattress cover that had a heavy plastic liner. Any time you moved it was loud and the mattress was uncomfortable. The other bed was comfortable. We could not get the spa tub to work and it wasn’t clean around the jets. The toilets look like the original toilets and did not flush very well. The outdoor patio was pretty small. We did not get the codes to the gate or door of condo emailed to us as we were supposed to. Staying at condos is new to me and my wife. This is our second stay at one. The first was in orange beach and they had employees working the front desk. I assumed there was going to be an employee here to give us what we needed. To my surprise there were no employees and no way to get ahold of anybody except by going threw the vrbo site. I messaged the owners twice with no answer back. This was around 5:00pm the evening of what was going to be our first night. My wife used her phone to find phone numbers which we called and they were no longer in service. Around 6:30pm I decided we were gonna have to go stay at a hotel. I had pulled out driving away from condo when my wife says I think I found the owners phone number. I pulled over and she called them for me. The call went to an answering machine and I was leaving them a message about who we were and that we didn’t have the codes to get in when a man picked the phone up. He was like okay are you at the door? I said no we can’t even get in the gate. I said we have been sitting out here trying to get ahold of some one. He kept trying to talk over me as I was trying to tell him what had been going on. He didn’t want to hear what I had been dealing with. He said I’m trying to give you the codes to the gate. I was upset from dealing with this for almost 2 hours so I gave the phone to my wife. He gave her the codes for us to get in. Then I received an email from his wife stating her records show that she sent me the codes. I did not receive them. She had to throw in that her records show she sent them. So needless to say our first evening was ruined. The complex was nice and clean. The area was very nice. I would recommend this condo. If you are staying in a condo make sure you have codes before you leave town if you need them . Do all of your asking ahead of time. It’s almost impossible to get ahold of anybody when you are on site. This guest had an unfortunate arrival that delayed their entry due to a misunderstanding. Once he contacted us by phone it was less than 10 minutes until he entered the property. Even though both my husband and I apologized the guest was frustrated and angry and only wanted to vent instead of listening to the help offered. The HomeAway website has all the information necessary for instructions to find and enter the properties. When you book you are invited to look at them and approximately 1 to 2 weeks prior to arrival you are again sent a reminder if you have not accessed the information. I usually send an additional letter welcoming the guests but I was out of the country until a few days before arrival and it was never delivered. Since we have been doing this for over 20 years and this is the first time an incident such as this as happened I feel this process must work normally and most people could understand and accept some responsibility in this situation. Our view was the bay side of this condo and we enjoyed looking at it daily; the glass enclosed area was wonderful! We could walk the bay beach or walk across the road and be on the Gulf side to enjoy the white sands of that beach. There were parks on both sides. January weather was mostly in the upper 50's and there were few people in the area. The well maintained condo had a spacious, thoughtfully equipped kitchen which I appreciated. We were close to restaurants and could drive across the bridge to Gulf Breeze for groceries and Pensacola for the Naval Air Museum, historic buildings, and other shopping. We are also very pleased to hear that our guests enjoyed their stay in the condo. Condo was great! Customer service from VRBO was horrible!! We will never use or recommend them!!! Condo was great. Customer service from VRBO was horrible. Will never use VRBO again!!! Wonderful! Nothing was misrepresented at all, and the views we're better than the photos. We are discussing an annual family event. Hopefully you can accommodate 25. We loved the property! We are glad you enjoyed the views. No better sunsets anywhere I have been. A great place for a family reunion with the large park across the street and Ft Pickens right next door. This condo was perfectly suited for our group of five. Even spacious enough to have meals with friends that were staying on the Island that weight also . The kitchen had everything we needed to make our own meals. Great location and nice roomy condo! Thanks for staying at our place. Glad you enjoyed your time there and it suited your needs so well. The condo was perfect. Nicely set up. Beautiful view. Clean. The area was not overly populated. Beaches white soft sand. One of the best trips to Florida I’ve had in a while! The condo is located one of the most beautiful islands in all of Fl. with pure white sand so fine that it squeaks when you walk on it. 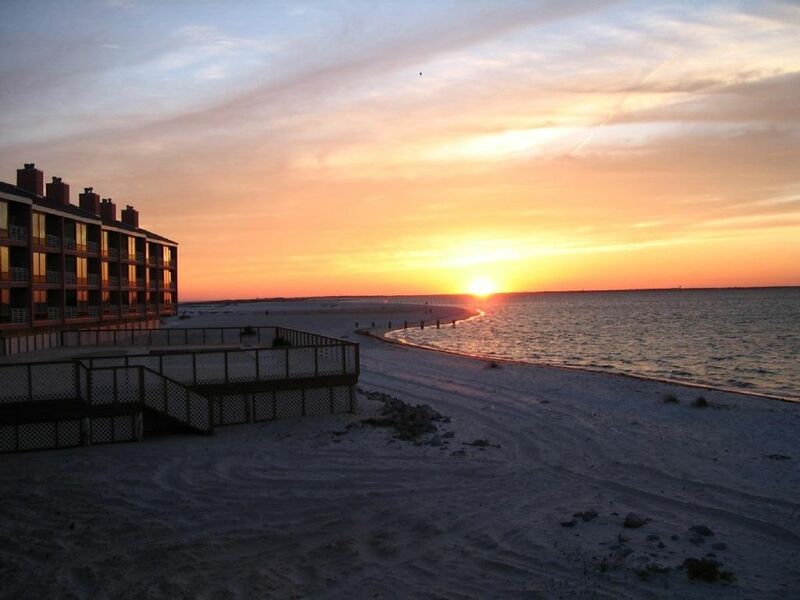 The location of the condo complex is the best on the Island with it being the last complex on Ft. Pickens Rd. that allows it to have beach on 3 sides. You are 1/2 mile from the best resterant/bar on Pensacola Beach [PEG LEG PETS] which is a short walk on the paved bike/jogging path or you can take the free trolley. The trolley can also transport you to the boardwalk about 1.5 miles, the main shopping area on the beach with other restaurants including fine dinning. Local artists have shops there as well as clothing stores and stores for beach accessories. Often on weekends local bands give free concerts at the small open air theater at the center of the Boardwalk. This area is on the water and has a marina where you can rent boats, wave-runners,sail boats ect., there is also miniature golf and go cart rentals. Other Activities: Some of my favorite things to do that cost nothing are beach-combing watching the sail boats from the balcony of the condo, or on Tuesday you can watch the Blue Angels practice from the balcony also. The sunset from the condo is stunning and after dark you will certainly enjoy the lights and the light house across the way. Ft. Pickens is about 7 miles west of the condo with nothing between the condo and the Ft. Pickens except gorgeous white sand and sea oats, some of the sand dunes are two stories high reminding you of the way most of Florida's beaches used to look. Ft Pickens has many free things to do including guides for touring the Ft., eco tours, ect. The Ft. also has a fishing pier. All this without leaving the island! On the mainland you can visit the world class Navy Air Force museum, old downtown Pensacola. Also visit the world renowned Joe Paddy's fish market. Golf: Golf is available at the beautiful Tiger Point golf club on the peninsula (Gulf Breeze) across the bridge. The club is a 15 minute drive. $1000-1600/Week, check, money order, Visa, Master Card, Paypal, ******************MONTHLY RATE of $2000.00 applies only to DEC, JAN, FEB Cleaning fees are additional $100.00. A deposit of 1/2 the rent is required to confirm your reservation within 5 days of booking. The balance is due 60 days prior to arrival. If you cancel your reservation you must do so 30 days prior to arrival to assure full refund. Within 30 days a full refund will be made only if the unit is re-rented.